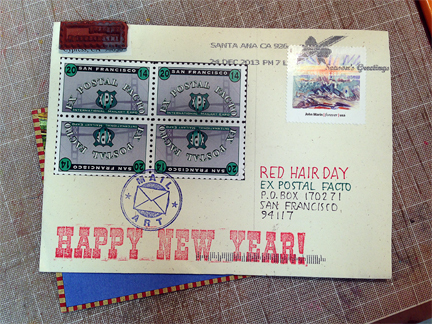 2014 has arrived — Ex Postal Facto can’t be far behind! Happy New Year to all mail artists, artistamp makers, visual poets, collagists — in short: this always expanding Network that we happily work within and with. As 2013 turned into the “fresh start” of 2014, I couldn’t help but be excited by all of the possibility and promise offered: new correspondents to meet, new projects to embark upon, new address books to fill. 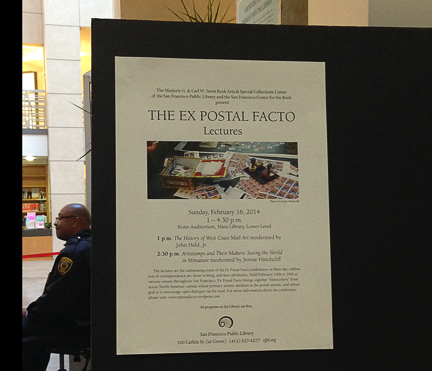 Part of this excitement stems from my anticipation of mail artists and postal enthusiasts arriving in SF for next month’s Ex Postal Facto event. 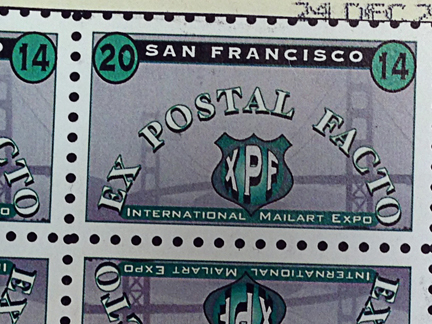 Every day my email inbox seems to hold another piece of I-can’t-hardly-believe-it news: another luminary, attending XPF; an idea for an additional event; someone working on a wonderful design or artwork for the weekend (ed: see Leslie Caldera’s artistamps for the event, above). Over the next few weeks, I’ll be sharing all of this exciting news with XPF readers. Places to stay, special announcements about “in-the-works” outings, names of other attendees, write ups in the press — these are all topics that will be addressed over the next few weeks. Be sure to stay tuned! And it goes without saying: I can hardly wait for 2014 to GET STARTED!